The indoor air quality in your home directly affects your family's health. From pet dander to allergens and pathogens, these contaminants lower the quality of your home's air, leading to increased risk of illness and allergies. 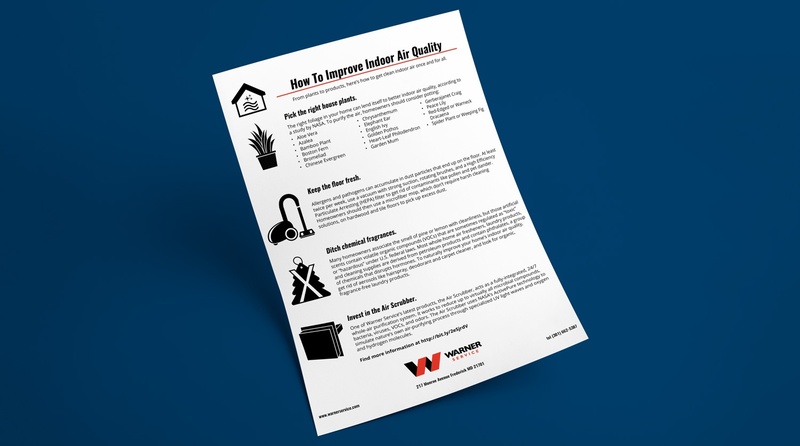 To improve indoor air quality, download our Guide To Improving Indoor Air Quality. The average 6-room home collects up to 40 pounds of dust in the air ducts per year. If you don't want to live with a giant dust bunny, download our checklist and never worry about dangerous build-up again. This printer-friendly checklist includes easy-to-follow instructions on how to keep your home dust-free. Want to make sure you're getting the cleanest clothing and linens? Download our Washing Machine Cleaning Guide to reduce allergens and pathogens that collect on clothing, minimize mold growth, and limit bad odors that result from mildew build-up. Bathrooms are one of the most used rooms in your home, so it’s best to keep them clean and sanitary at all times. Maintaining your bathroom, including its plumbing, can prevent mold and mildew build-up, poor indoor air quality, and more. Use our step-by-step checklist once a month to crack down on cleaning and bathroom plumbing maintenance. Want to extend the life of your air conditioner and breathe cleaner air in your home? Download our checklist to accomplish these goals. This checklist outlines every necessary step to make your air conditioner perfom at its best for longer, and the printer-friendly format lets you reuse it as many times as you'd like. Warner Service wants to lower your energy bill with a checklist of all the ways you can save energy (and money) in your home -- about hundreds of dollars annually. Learn about a few easy ways to eliminate energy loss around your home, lowering your energy bill immediately. Need help getting rid of those tough stains? Download Warner Service's Stain Removal Guide, which determines the right laundry products for different stains, teaches you how to wash and dry clothes for the best results, and saves money by using DIY products instead of harmful off-the-shelf chemicals.